Danny Buteau of Husson University (right) tries to take down Marcos Mercado of Springfield Tech Community College in the 141-pound final Sunday at the National Collegiate Wrestling Association Championships in Allen, Texas. Buteau persevered in the tournament after learning that his uncle, Shane Sauer, had been killed Friday in a shooting in Swanville. Danny Buteau arrived in Allen, Texas, last week with the single-minded determination to win a national wrestling championship. The Husson University sophomore, who won four individual state titles while attending Oak Hill High School in Wales, was well on his way after the first day of competition at the National Collegiate Wrestling Association championships, which feature schools that do not have varsity programs. Three early victories advanced Buteau to Friday’s 141-pound quarterfinals, but moments before he stepped onto the mat again he received horrifying news from home — his uncle, 26-year-old Shane Sauer, had been killed in a shooting in Swanville. Austin McDevitt, 22, of Morrill has been charged with murder in Sauer’s death and made his first court appearance Monday at the Waldo Judicial Center in Belfast. Buteau did win that match and went on to defeat the wrestler who had eliminated him in the 2018 national semifinals. He then outlasted the fighter who had edged him in the Northeast regional qualifying meet two weeks earlier to achieve his championship goal. Buteau is one of two Husson wrestlers who practiced and traveled with the University of Maine club team this winter on the way to earning NCWA All-America honors. 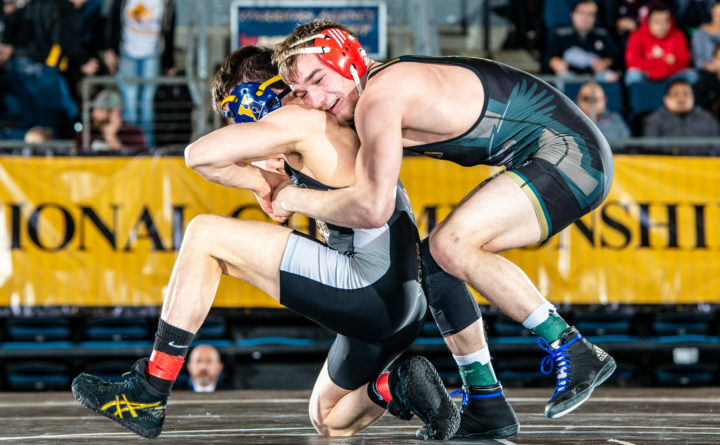 Eddie DeRoche, a former wrestling standout at Mountain Valley High School in Rumford who returned to the sport after taking last year off, followed up his Northeast Conference title by finishing sixth at 149 pounds at nationals. His freshman year of club wrestling at the Bangor school ended just shy of All-America status. Buteau is pursuing a physical education degree at Husson after a star-studded athletic career at Oak Hill where he won 179 career bouts and four state wrestling championships. He also played cornerback and receiver to help the Raiders win Class D football state titles in 2013, 2014 and 2015. He also officiates high school, middle school and peewee wrestling. 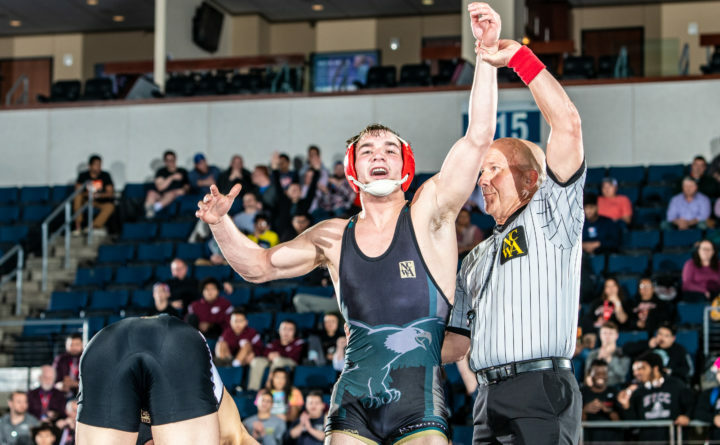 Buteau took a 16-2 season record to the 2019 nationals and was seeded fourth in the 64-man bracket at 141 pounds after losing a one-point decision to Marcos Mercado of Springfield (Massachusetts) Tech Community College in the March 2 Northeast Conference finals. Buteau was upbeat after winning three matches during Thursday’s opening rounds, but his confidence was shattered at least briefly the next day when he learned of his uncle’s death. Buteau was taken down by his opponent in the opening seconds of his ensuing match, but quickly regrouped to score a second-round victory and advance to the semifinals. “After that the shock was gone,” he said. “I already knew what happened, and from there I told my parents to please not bring [Sauer’s death] up because I didn’t want that to be on my mind and I really needed to focus on one thing and one thing only. Maine Maritime Academy coach Don McCann, who worked Buteau’s corner during the tournament, was unaware of the tragedy as he watched the quarterfinal. “I can only imagine what Danny was going through,” McCann said. “He did get taken down early, which was a little surprising, but at the time I didn’t know anything other than wrestling going on. Buteau slipped past top-seeded Wesley Hollingsworth of East Carolina 4-3 in the semifinals, avenging an overtime loss in last year’s quarterfinals. Saturday’s championship bout was a 3-2, double-overtime survival of Mercado. The winning point came when the second-seeded All-American was penalized for stalling while trying to prevent Buteau from escaping his way to victory. Buteau quickly sought out his father in the stands, and dedicated the championship to the relative he’ll never see again. “It’s a very rare person who can take that kind of horrible situation and compartmentalize and still perform at such a high level. It was incredible,” McCann said.